I started jumping up and down, saying, “A monarch! A monarch!” and pointing like an idiot. I snapped one quick shot, then sacrificed my position to let my “students” get in close. Everyone lunged in, and a few people got some really decent shots of the butterfly. She unfortunately flew off before I had a second go with my camera. However, even if I didn’t get a really good shot of her, I was still thrilled to see her. Monarch numbers are WAY down in many places this year, and it was great to see one more so late in the year. November 2! Couldn’t have been happier to see her! That is a gorgeous photo. The colors are soft and lovely. I’ve only gotten 3 or 4 here in northwest Florida this fall. Not good. 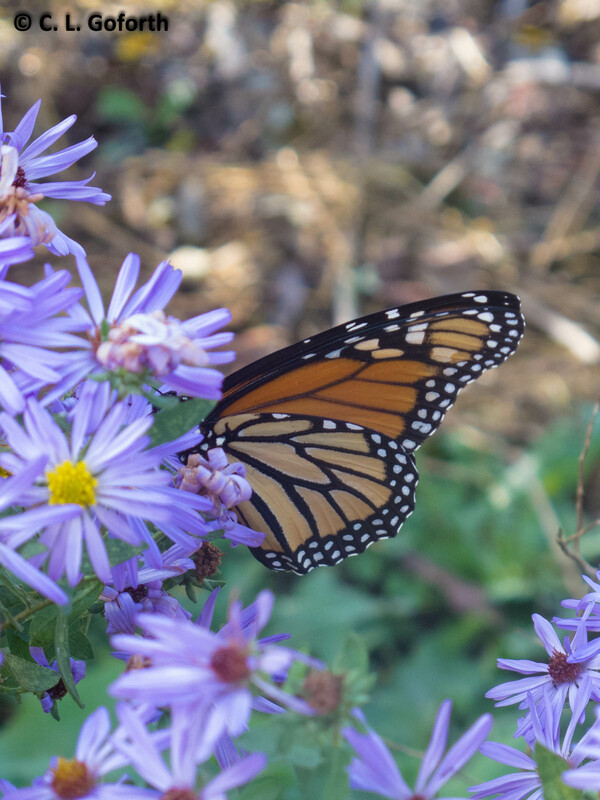 It’s so very obviously a Monarch that it looks much more novel seeing it peep out from behind the asters. I have just discover the power the asters have in attracting pollinators at this time of year. Needless to say I’m going to invest in a few more for next year. I felt the same way when I saw one the beginning of October, better late than never!! :) I planted asters this fall, too late for visitors, but will be watching closely next year.